There’s a new coffee shop nearby so we made a plan to visit. It’s only been open seven weeks and they haven’t even had their grand opening, but we had to give Kakawa a try. I loved their drip coffee…smooth with no burnt aftertaste. Patty loved their cappuccino…a traditional cappuccino laced with dark chocolate & cardamom. 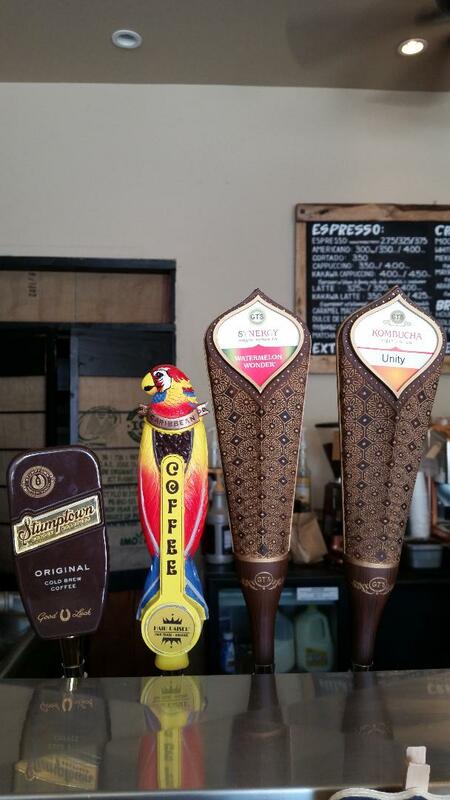 Kombucha and cold brew are on draft. They offer freshly baked bakery items and are determining their future sandwich choices. There’s a “Happy Hour” from 2-4 when a Frappuccino-type drink is featured. It’s a small place with a knowledgeable barista who seems committed to excellence. Seating was limited the day we visited, but we learned more furnishings will be arriving soon. Off street parking worked for us, but there isn’t a public bathroom. We’re always eager to try new places and always wish them success! Visit them Monday through Friday from 6:00 AM to 6:00PM or Saturday and Sunday 7:00 AM to 5:00PM. When Portland’s Coava Coffee Roasters went looking for a 2nd location they chose San Diego over the bigger markets in San Francisco & LA. Why? According to their website it’s because we are a “burgeoning craft coffee community”. Yet according to one of their San Diego baristas, “San Francisco is overloaded with craft coffee & no one wanted to move to LA!” Whatever the reason, it’s nice to be recognized for our craft coffee scene. 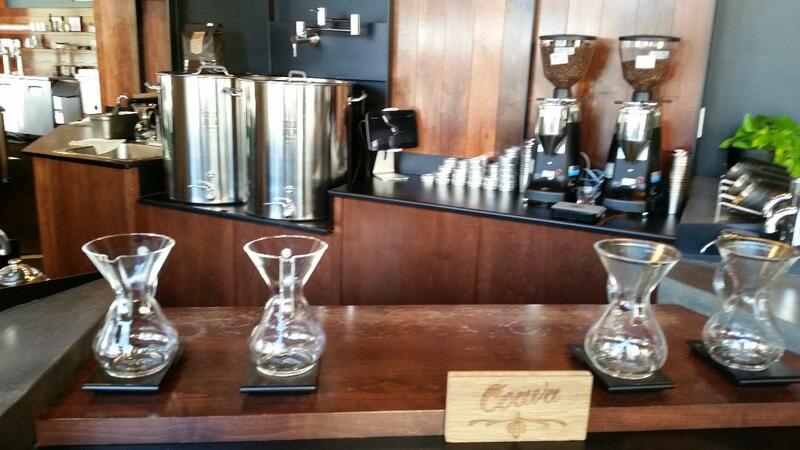 Coava offers traditional drip coffees, espresso options, pour overs, cold brew, & nitro infused coffee. I had a cortado, or a shot of espresso with equal amounts of hot milk & a little froth on top. I think of it as a short cappuccino, although that’s not an official description. Their version was just what I needed for a quick afternoon pick-me-up! 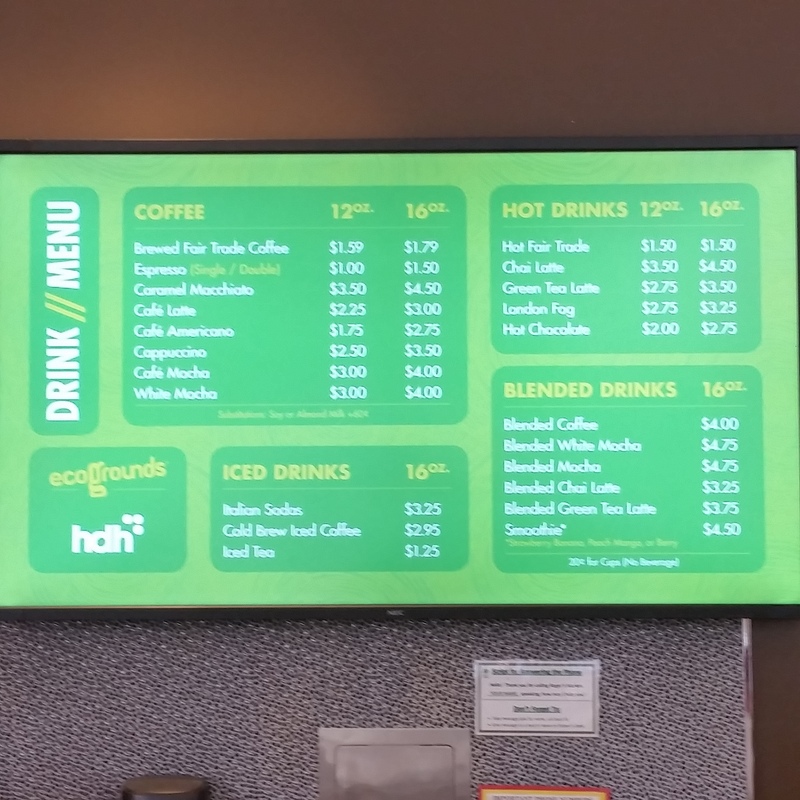 Should you want a beverage other than coffee, they offer select juices, tea, wine, and beer. They also offer pastries, parfaits, sandwiches, salads, and soups. practice of smelling, then slurping coffee when evaluating for purchase or in competition. It’s also offered just for the enjoyment, as they do at Coava & other roasters in town. So what does Coava mean? We were told it was the first written word found for coffee beans. I didn’t verify this on Google, though…sometimes it’s nice just to believe something is true! 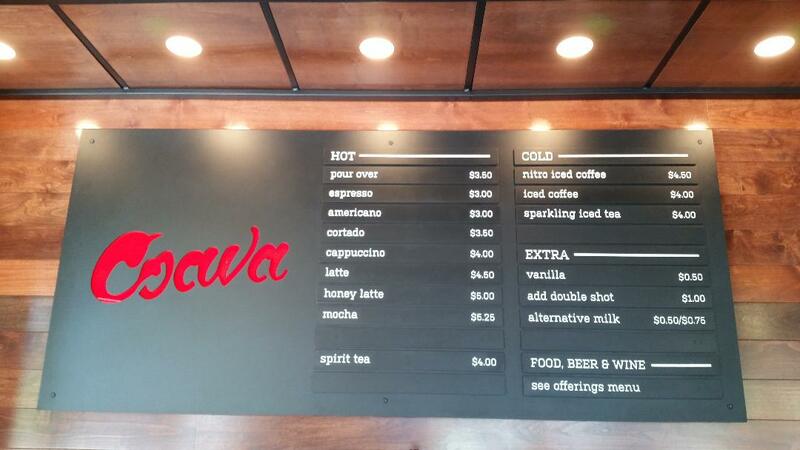 Coava is at street level of the Westin Hotel, just west of the court house. I mention this as it’s a perfect stop from the trolley on your way to jury duty. Get a cup of strong coffee before being bored to tears while waiting in the jury pool! They’re open 6am-6pm, Mon.-Fri. and 7am-6pm Sat. & Sun. Parking is a problem anywhere downtown, though. Don’t make a special trip just for coffee, but should you be here on business or pleasure know that meters will cost you $1.25 per hour with a 2 hour limit, but Sundays the meters are free & you can stay all day! The usual morning treats were for sale, along with Nomad Donuts. I’ve never tried Nomad Donuts, but it’s my understanding that they are a popular donut these days. They are a San Diego company with the descriptive line “Globally Inspired in America’s Finest City” on their website, www.nomaddonuts.com. This is a welcoming outdoor space with lots of seating and even a cozy spot for kids to play while parents kick back with coffee and a sweet or savory treat. Pets are welcome, too. We were told music and movies are planned for the summer. Sign up for their online newsletter at www.communalcoffee.com. It definitely has a hip-and-happening vibe! Like the North Park location, this location of Communal Coffee offers fresh and charming bouquets for sale, plus coffee cups, decorated shopping bags, and coffee, of course. 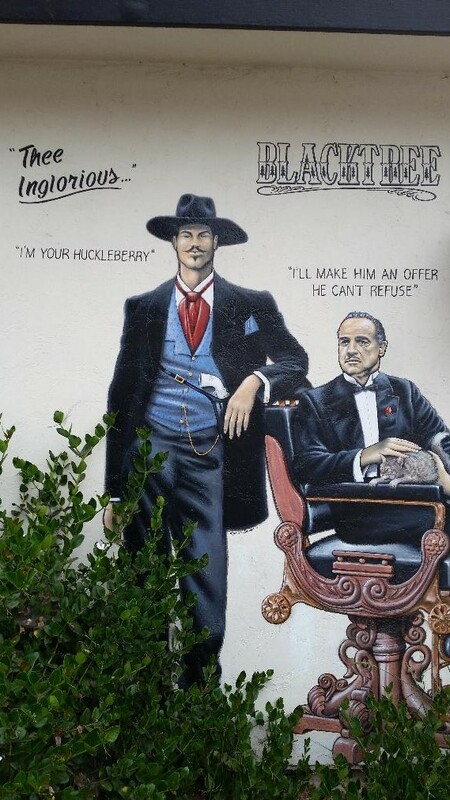 Take a look at the fabulous murals within just a couple of blocks of the coffee shop (some posted below). South Park is also known for their Craftsman homes. Their annual home tour is May 19, 2018, with tickets available at http://www.southparksd.com/events/old-house-fair/. Off-street parking was plentiful the morning we visited, but a few spots on nearby Juniper are metered. Just a little alert: They don’t have indoor seating for those scarce rainy days nor toilets, but don’t let that deter you. This was a fun outing and I was definitely impressed. 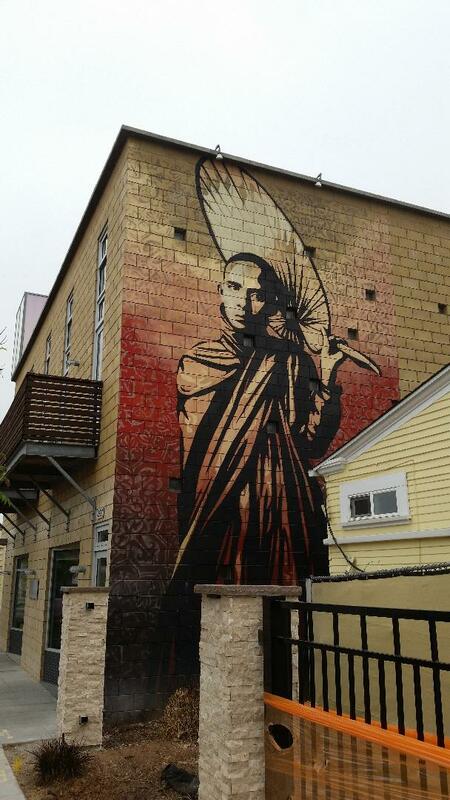 Look for this mural by Shepard Fairey on 30th St. between Juniper & Ivy. This 1920’s Pacific Beach home welcomes coffee lovers as early as 5:30am. are many flavors, but my favorite is maple walnut. Wake up to smell the coffee and the roses! 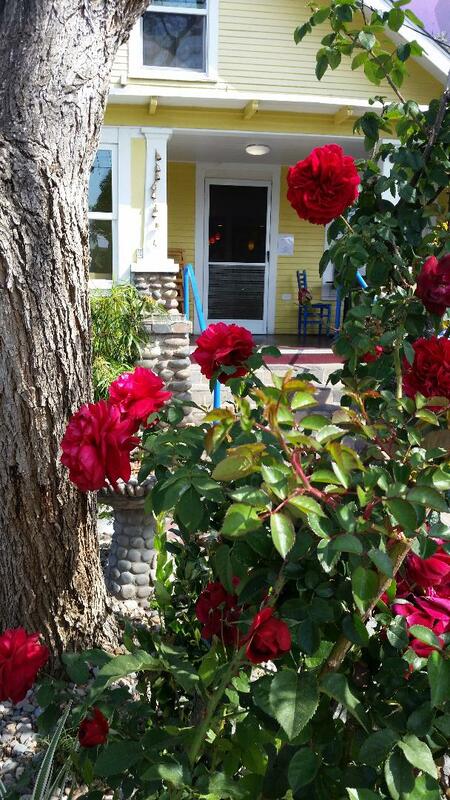 This location is a charming yellow cottage with roses and a huge magnolia tree offering shade and even more charm. There is plenty of indoor, porch, or garden seating, but dogs are limited to the porch or garden seating areas. In a hurry to grab and go? While there’s no drive through there are several green curbs in front which are usually open for a quick escape or take a short walk to the beach (only 2 blocks away). Just pay attention to street cleaning days (a ticketable offense). The day is posted, but it varies with the side of the street you use. Hungry? 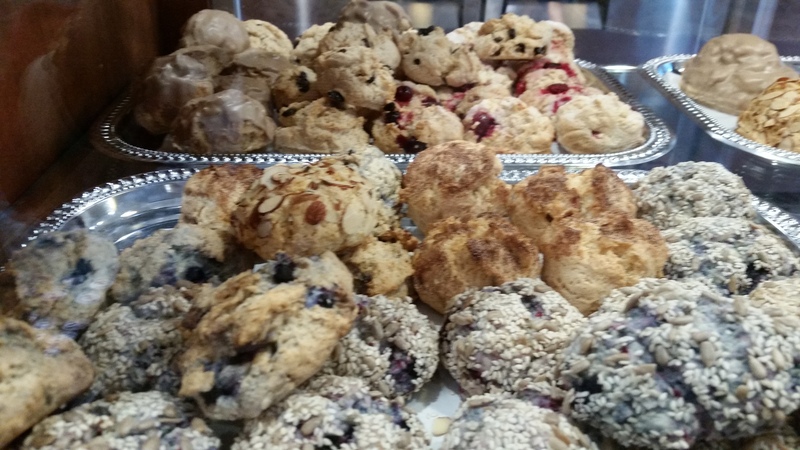 Besides their delicious scones, they offer other breakfast breads, oatmeal, sandwiches, soups, and more. A little history on the property: I had long been a fan of Café 976, the previous coffee shop at this location until they changed from counter coffee service to table service. Sorry, but when I want coffee I want it NOW, I don’t want to wait so I’m thrilled with the change back to counter service. Open 5:30am Mon.-Fri. and at 6:00am on weekends (but I’m told someone will help you if you’re there before 6:00am on weekends). They close at 5:30pm Mon.-Thurs. and at 9:30pm on Fri. and Sat. 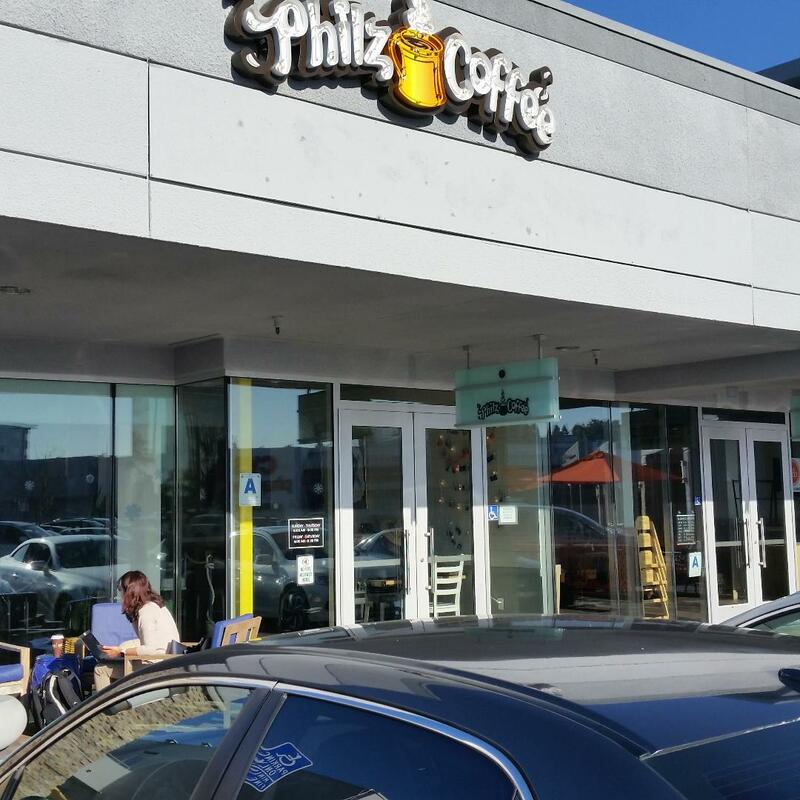 Patty visited Philz in San Francisco’s Mission District a couple of years ago and we were eager to try the new San Diego location. We usually visit independent coffee shops, but Philz has locations in San Francisco, Los Angeles, Encinitas, and Washington, D.C. I had to try the Canopy of Heaven (herbs, citrus, strawberry) and Patty had a Tantalizing Turkish (cardamon, herbs, tobacco…not actual tobacco). The menu has the coffee divided into three categories: dark, medium, and lighter blends. The menu is so intriguing that it serves as a magnet to encourage me to return and try another cup. Good looking food, too. The day we visited the place was bustling with every table occupied and every single person (with the exception of two men having a conversation) was on their computer or phone. What happened to going out to savor a lovely experience without being connected to WIFI? Oh well, we enjoyed a table outside. Philz was started by Phil (with no z) from Lebanon. He started a quest 25 years ago to make a really great cup of coffee. Their coffees are customized blends crafted over time by Phil. Many drinks include a mint leaf on the top. 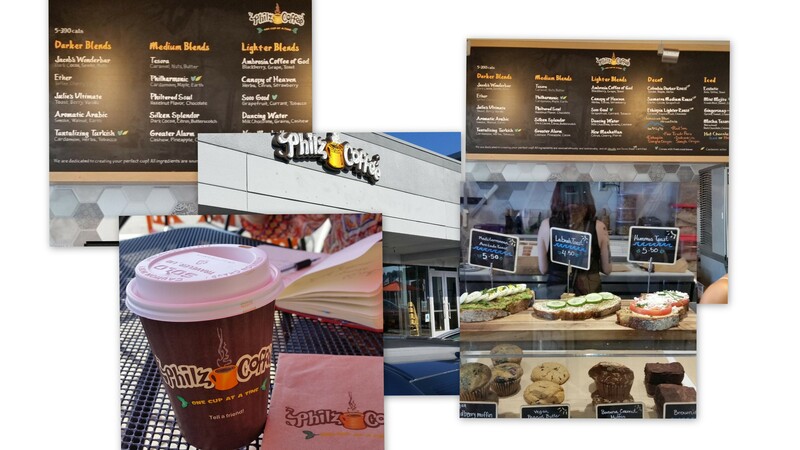 Visit their website at http://www.philzcoffee.com for the full story. Parking is plentiful and free. Orders may be placed in advance for easy pick-up at the front counter. Shade covers or heaters, depending on the weather, make for comfortable outdoor seating. If you like good coffee and inspiring stories, read on. 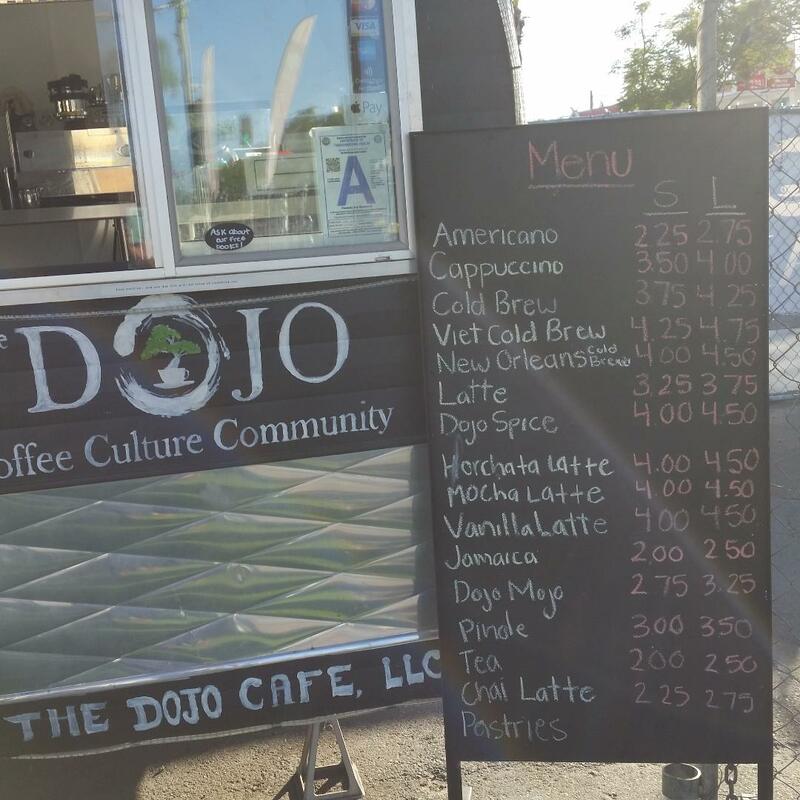 The DOJO Coffee Culture Community grew out of an empty lot on El Cajon Blvd. at 44th St. to address the lack of safe, culturally reflective, and productive spaces in City Heights. An empty lot was a blank slate for locals to congregate, network, and develop or show case their talents. 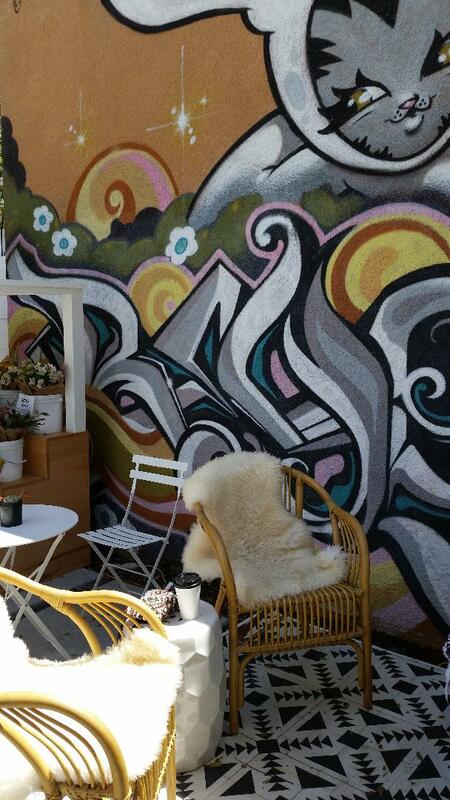 It’s a community gathering place with good coffee, too, similar to The Quartyard in East Village. 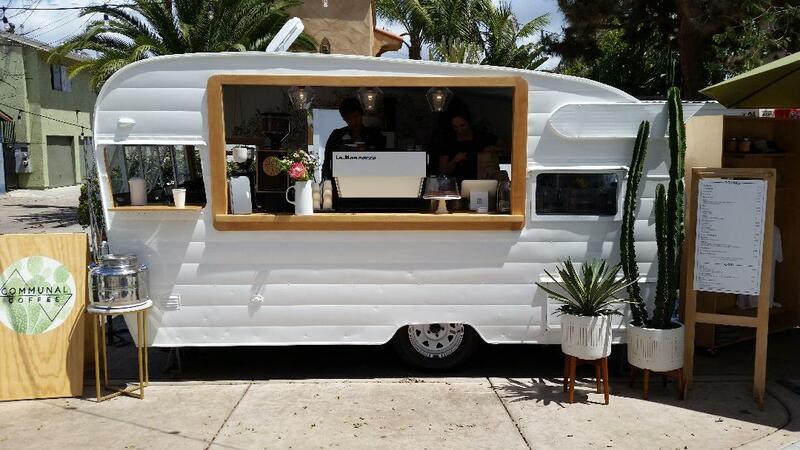 An onsite trailer provides some great brews with coffee beans from local Dark Horse Coffee Roasters. Drink variety means there’s something for every taste. Traditional coffee and tea drinks are available, but so are Horchata lattes, Jamaica, Viet Cold Brew, and their own creation: Dojo Spice, a delicious mix of espresso, almond milk, cinnamon, and allspice. Loved it! They also offer pastries & snacks. The DOJO sponsors free inspiring workshops, like Reach Your Goals and Business Strategies for Artists. They also have free dance lessons at least twice a month. Salsa, cambia, bachata, anyone? The Hoover High Jazz Band practices here, which sounds like a free concert to me. And Mommy & Me classes are in the works. For more free events check out their Facebook page. Why the name The DOJO? 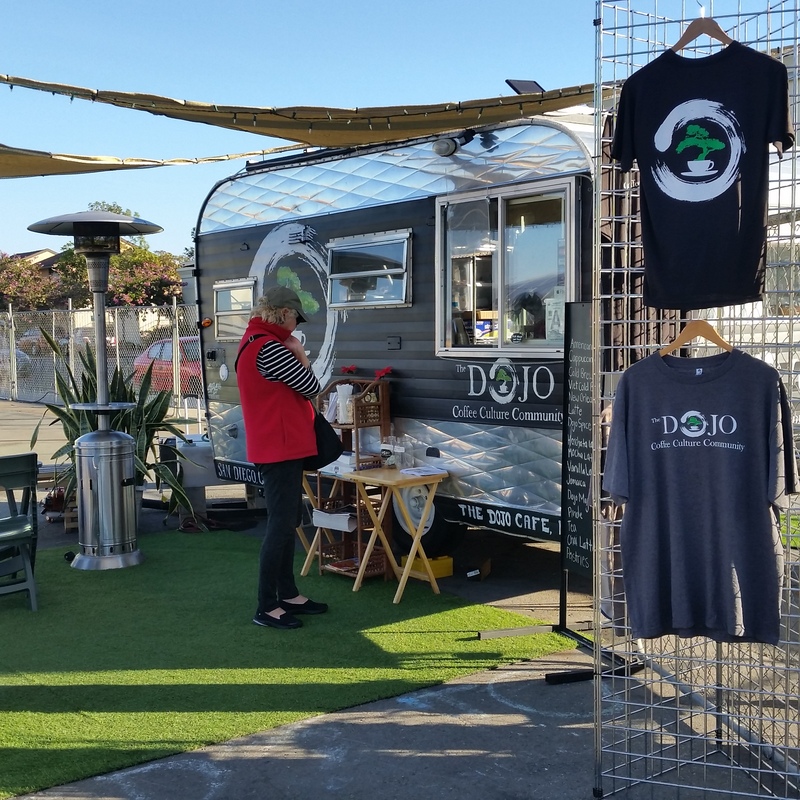 Because the term DOJO is a Japanese term which literally means “place of the way,” and here in the States it generally refers to a martial arts training place, but they say The DOJO Cafe will serve as a safe training place for aspiring residents in underserved communities to discover their way. From the staff members we met I’d say it’s working. Parking can be tight. We found street parking on Fairmont or 44th St., north of El Cajon Blvd. If this location sounds vaguely familiar, it’s perhaps because you remember the jingle about a certain Ford dealership at “Fairmont and El Cajon”. The DOJO is in their space, next to the Copley-Price YMCA. 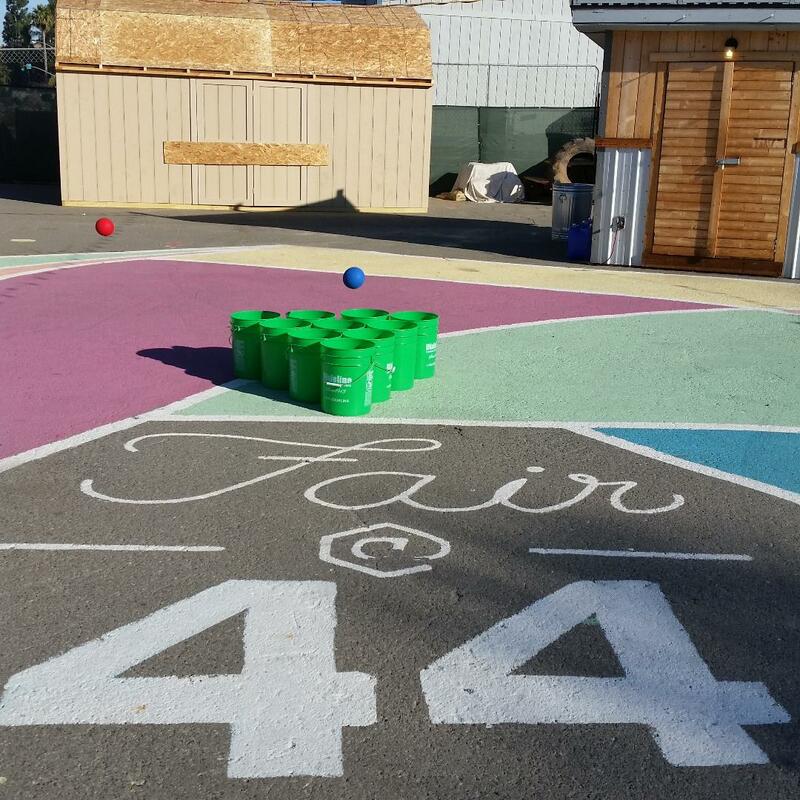 Come by for a game of bucket pong, but check it out soon as apartments are slated for the lot in the next few years. Bucket pong was a new game for me, but I loved it right away! Open Mon.-Sat., 7:00am-6:00pm. Closed Sundays. 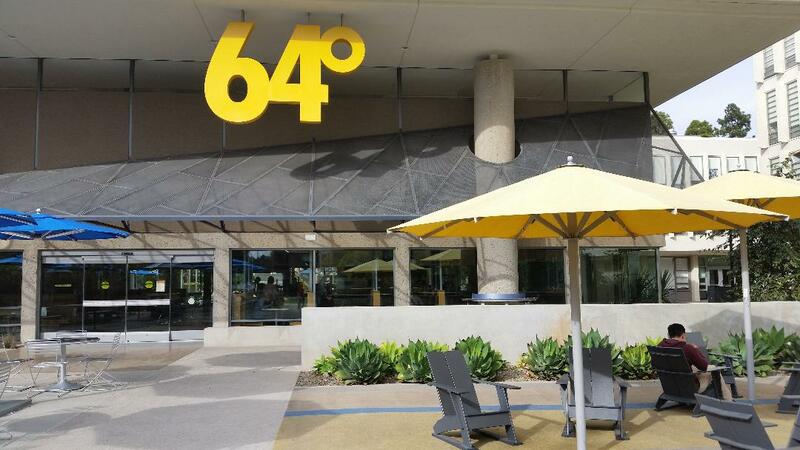 This month’s adventure took us to Revelle College (part of UCSD) for a look at their residential dining experience, 64 Degrees. 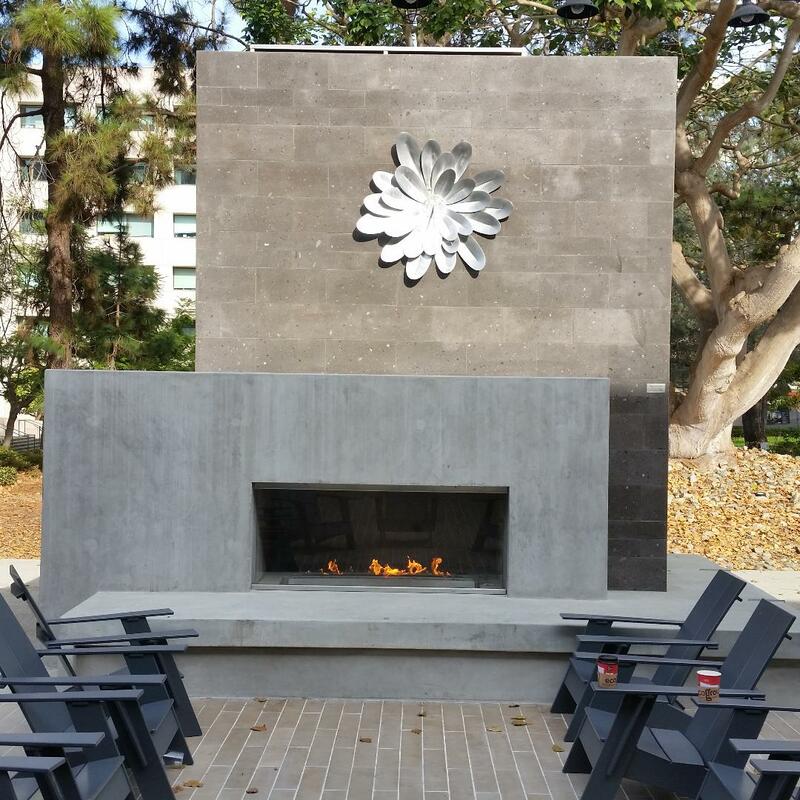 The name comes from the average water temperature in La Jolla, the founding year of Revelle College, and supposedly the height of Roger Revelle, the college founder. The project has a variety of restaurant options, dining spaces, a market, and more. We got our coffee at Roger’s Market, which is part of 64 Degrees, and enjoyed sitting outside by the fire on chairs that were a modern take on Adirondack chairs. It’s a fascinating visual experience with its modern, clean lines and various spaces to sit, eat, drink, or just people watch. There’s even a small meditation room to tuck away for a quiet space. 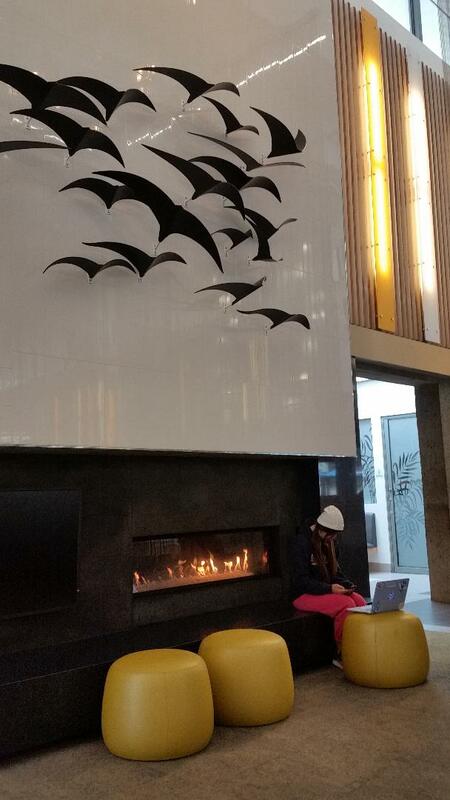 …or relax by the fire inside. The entrance if coming from La Jolla Playhouse. Roger’s Market is on the left. 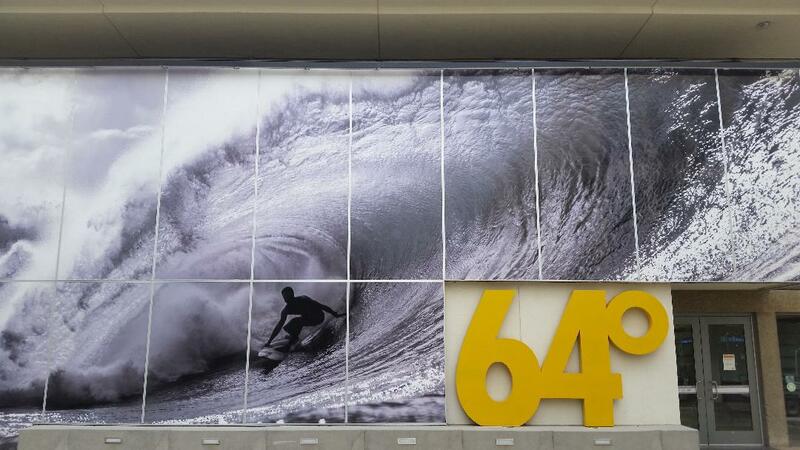 Look for this striking photo on the east side of the building (enter Roger’s Market to the left). It almost . . . just almost . . . makes me want to go to college again! A campus map showing location of 64 Degrees, the Revelle College dining hall with Roger’s Market: https://www.google.com/maps/place/64+Degrees/@32.874214,-117.241884,17z/data=!4m5!3m4!1s0x0:0x51e8bb9f09bfd68!8m2!3d32.8747459!4d-117.2420341?hl=en-US We parked at La Jolla Playhouse, but wherever you park it’s important to honor all parking signs and pay any parking fees! 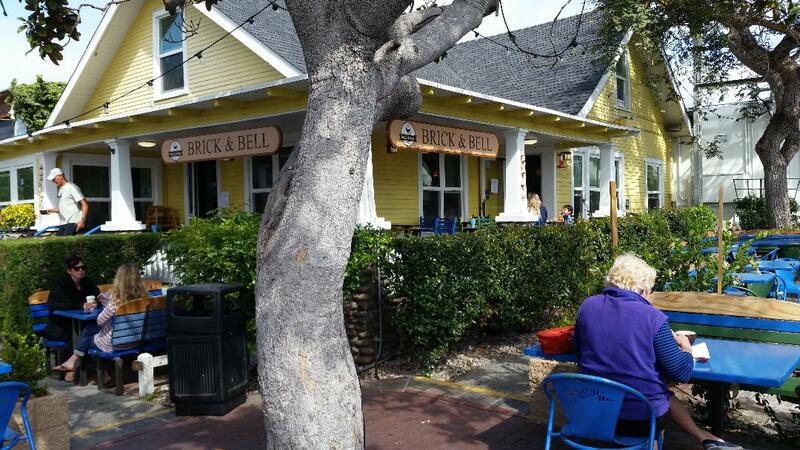 It’s also an easy bike ride from Pacific Beach, University City, or La Jolla. Coffee is fair trade and prices are reasonable.